SPRINGFIELD — The official unveiling of the butter cow at the 2018 Illinois State Fair in Springfield didn’t go as well as organizers had hoped, though dairy building manager Marla Behrends soon had the problem literally smoothed out. 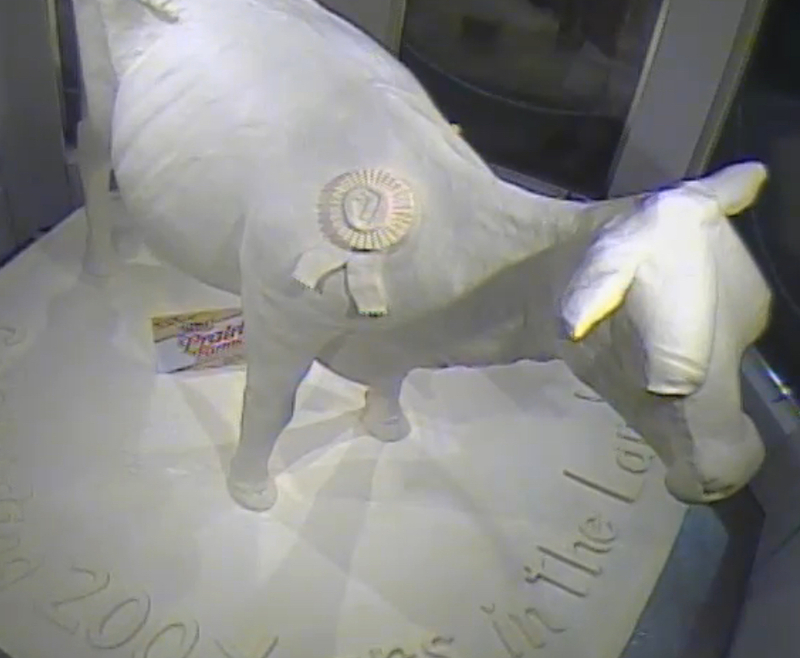 The issue arose soon after the Aug. 8 unveiling of the butter-carved bovine revealed a misspelling of the word “bicentennial” on a plaque noting Illinois’ 200th anniversary of statehood. The plaque, also made of butter, would be scraped clean and redone in time for the fair’s official opening the following night, Behrends, of the Midwest Dairy Association, told reporters gathered for the unveiling. The Springfield fair runs from Aug. 9-19. SPRINGFIELD — New Illinois State Fair manager Luke Sailer can be commended for keeping the focus of the state fair where it belongs: on agriculture. In addition to the traditional junior livestock and 4-H exhibitions, agriculture’s presence and influence can be found nearly everywhere on the fairgrounds. An improved Illinois Department of Agriculture pavilion should be the among the first destinations for farm and rural folk. There, Illinois Specialty Growers are serving fair visitors fresh, Illinois-grown food with a different specialty crop highlighted daily. Specialty cooking stage demonstrations will be held throughout the duration of the fair, and visitors can purchase fresh sweet corn, cantaloupes, peaches, tomatoes, apple cider slushies and more foods made by Specialty Growers members. BLOOMINGTON — The Illinois Farm Bureau news service reported that the U.S. Army Corps of Engineers is planning to shutter several lock and dam systems on the Illinois River in 2020 for much-needed upgrades. Saying the current gates at the Starved Rock dam and others are “on the verge of failure,” the Corps decided to shut down virtually the entire Illinois River system during the summer of 2020 in order to effect repairs. Six of the eight locks and dams will be shuttered during the summer. The closures will occur simultaneously between spring flooding and harvest, according to Tom Heinold, chief of operations for the Corps’ Rock Island District. “That’s a pretty narrow window, but we’re going to try to make the negative impact to the navigation industry as small as we can,” he told IFB reporters Deana Stroisch and Dan Grant. In addition to Starved Rock and La Grange, lock and dam systems at Peoria, Versailles, Morris and Joliet were also tagged for closure and repair, according to the report. CHAMPAIGN — The Illinois Soybean Association elected its 2018-19 executive committee and seated new directors during its annual meeting in Champaign Aug. 1. Lynn RohrScheib, a Fairmount farmer, was reelected as chairwoman. Other committee leaders elected were vice chairman Doug Schroeder of Mahomet, treasurer Tom Kentner of Danville, secretary Rick Rubenacker of McLeansboro, and assistant secretary-treasurer Jim Martin of Pontiac. Joining the executive committee are Roberta Simpson-Dolbeare of Nebo as production and outreach committee chairwoman, and new marketing committee chairman Austin Rincker of Moweaqua. In addition, five district and two at-large directors were elected by the ISA, which has been working to fortify relationships amid trade uncertainty brought on by the recent tariff wars between the U.S. and many of agriculture’s historic trade partners. Recently, the ISA checkoff program hosted a team from the China Food Additives and Ingredients Association, connected with consulate representatives from Mexico, Canada and the European Union, and welcomed a group from Australia, according to the soybean association. Despite the uncertainties, it is good to know that Illinois growers are continuing to build and maintain relationships with key trade partners.